This is a note about an abstract presented at the JCM MAKASSAR 2011, the 36th HAGI and 40th IAGI Annual Convention and Exhibition. 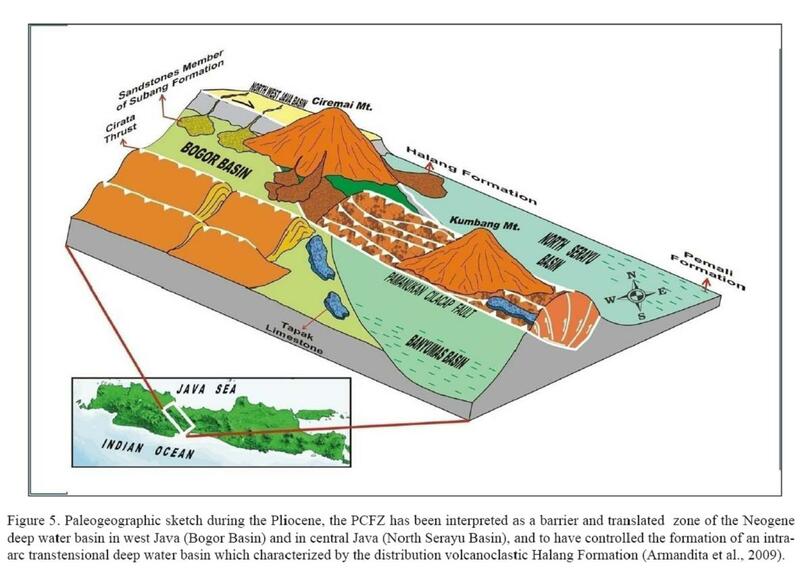 A NW – SE trending Pamanukan Cilacap Fault Zone (PCFZ) has been interpreted to become barrier between Neogene deep water basins in western and central Java. The PCFZ is interpreted to have translated the eastern extension of SW-NE pre-Tertiary subduction zone ±200 km to the southeast. These tectonics models suggest that the prolific hydrocarbon zone associated with Sundaland, originally developed to the east of the Northwest Java Basin (NWJB) has been translated to the southeast along the PCFZ. This regional tectonic reconstruction can be a possible alternative model to explain the distribution of numerous hydrocarbon seep in the Neogene deep water North Serayu and Banyumas basins. Tagged awang satyana, cipi armandita, ma'ruf mukti, Neogene deepwater basin, oil seep, Pamanukan-Cilacap Fault Zone, pre-Tertiary subduction zone, strike-slip fault, tectonics of indonesia.